Replace your worn out front differential bushings. Worn Bushings are a common cause of front end shaking and vibration. Note: All Mazda Scrum Trucks are manufactured by Suzuki. 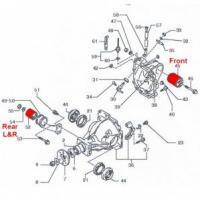 Parts may bear both or either or Suzuki or Mazda Part Numbers.